Glad you love it Steve. Beautiful works, the howling woman and Gothmaz! 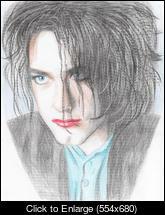 Here is my drawing of Robert Smith (it's a copy of a well known photo which is one of my favorite ). Gorgeous work, you are such clever people . I wasn't sure where to put this, so please feel free to move this. I saw this a few days ago and most of you probably have too. An artist named Butcher Billy has created some "comic" art of Robert Smith, Mozz, Siouxsie, Ian Curtis and a couple of others. I am very tempted to buy the Robert one. Saw this on buzzfeed too. I liked Sioux as Wonder Woman. I've seen this fan art of Robert Smith in the past but did some investigating on who the artist was. It's done by Ben Towle of Oyster War comic, I know him through various social networks, but never realized he did this. It's pretty cool. Sweet, are we not connected via twitter? I may be slightly confused here sorry, lol.